Captain Taylor's Company of the 7th US Infantry was formed in 1989 from a focus group of interpreters at Historic Fort Snelling. The Company exists to gather and enact the stories of the Early Republic. By exploring this heritage, it is our intent to educate and entertain. The first goal which the initially unnamed unit had was the January 1990 reenactment of the Battle of New Orleans, which was successful. Since the numbers in membership have never approached the size of any regiment, the unit humbly became a company. Until 1996, we were known by a company commander, Captain Elijah Montgomery. In 1996, the membership changed its name to Captain Zachary Taylor's Company to reflect a regional association to the War of 1812. The nearest battle to the Twin Cities was at Prairie du Chien, 220 miles south. The brief, nearly bloodless fight was between Taylor's Company and British and Indian forces. Secondly, Zachary Taylor later commanded Ft. Snelling, the center of our unit's activity over the years. In the past ten years, our members' interest has taken the unit to far flung War of 1812 sites such as Prairie du Chien, Ft. Osage, Green Bay, Mississinewa, Tippecanoe, Ft. Madison, Ft. Massac, and of course New Orleans. 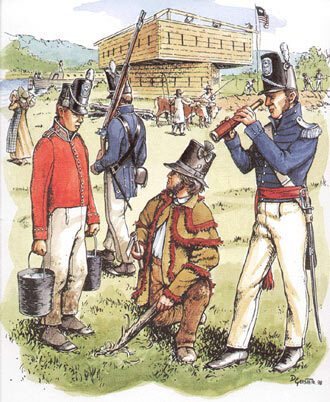 In recent years the unit has assisted local historic sites to begin and maintain new programs which teach the War of 1812. These include Historic Fort Snelling (War of 1812: America's First Forgotten Conflict), Northwest Company Fur Post (NWC in the War of 1812), and the Sibley House Historic Site (Jean Baptiste Faribault's War of 1812). Taylor's Company actively seeks to be involved in the Twin Cities community, and is available for appearances, programs, and encampments. Taylor's was a founding member of the Upper Mississippi Brigade in March 1997. Dues are $10 per year for each soldier or laundress, or $15 per household, payable each July 1st. Join today and keep the historic world safe for democracy! Check our articles for more information about the historic 7th Infantry.